Neurofibromatosis type 1 (NF1) is one of the most common autosomal-dominant inherited syndromes, affecting 1 in 3,000 to 3,500 people with a wide range of clinical manifestations and disease severity. Friedrich Daniel Von Recklinghausen first described its features in 1882. Most importantly, the hallmark of NF1 is the development of multiple benign tumors of the peripheral nervous system with an increased risk of malignancies. Underlying the clinical manifestations of NF1 are its unique genetics and the pathophysiology of the disease. The NF1 gene was identified in 1990. By genetic linkage analysis of families with multiple affected members, the gene was mapped to chromosome 17q11.2. Balanced translocations that produced NF1 were isolated in hybrid cell lines from two unrelated individuals, and breakpoints were physically mapped 55 kb apart in the same region identified by the genetic mapping. Genomic DNA mapping to this region provided probes to identify clones from complementary DNA libraries. Of the four genes found at this locus, mutations in genomic DNA from affected individuals consistently involved only one of the four genes, thereby identifying the NF1 gene. This NF1 gene encodes for a 2818 amino acid peptide (the neurofibromin protein). Neurofibromin functions as a tumor suppressor and is expressed predominantly in neurons and glial and Schwann cells. The fundamental mechanism of tumor formation in NF1 is connected to the oncogene Ras. Ras encodes a family of GTPase proteins that are ubiquitously expressed in all cell lines and organs. This protein family is involved in cell growth, differentiation, and survival. However, when overexpressed or uncontrolled, this protein family also leads to cancer formation. The central domain of the neurofibromin protein is homologous to Ras GTPase activating proteins (GAPs), which convert Ras into its inactive form, thus suppressing cell growth. Ras has two conformational states: active when GTP-bound and inactive when GDP-bound. Neurofibromin switches Ras to the inactive GDP-bound state. Thus, the loss of the normal function of neurofibromin in NF1 results in loss of Ras suppression, subsequently leading to cell proliferation. This uncontrolled cell growth underlies the predisposition to developing plexiform neurofibromas and their progression to malignant peripheral nerve sheath tumors. A larger deletion encompassing the area of the NF1 gene is present in approximately 5% of patients. These deletions are almost always found on the maternal chromosome. These patients have florid manifestations and a higher propensity for malignancy and cognitive issues. Screening for these micro-deletions may be clinically warranted. Alternatively, new smaller intragenic mutations are almost always of paternal origin. Hundreds of different mutations are known and half of all NF1 cases represent new mutations. In NF1, a “second hit,” through either loss or mutation, to wipe out the normal (wild-type) NF1 allele may be necessary to produce the tumors. Several neurofibromas in patients with NF1 have shown no functional neurofibromin. Alternatively, café-au-lait spots show a normal NF1 allele present. Here, as with other findings, an insufficient (as opposed to absent) amount of neurofibromin may be present (haploinsufficiency) to prevent these manifestations. Patients with NF1 can have disease manifestations in nearly every organ of the body, including the skin, skeleton, skull, brain, vessels, and eye. 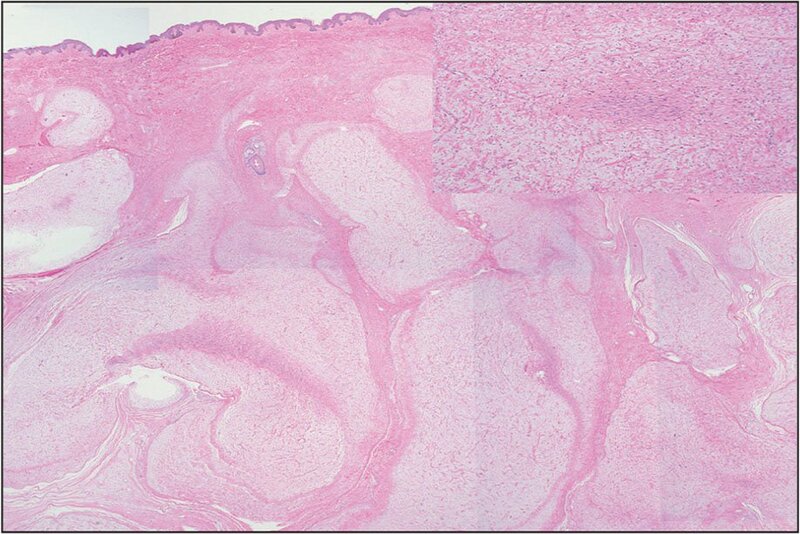 Café-au-lait macules, skin fold freckling, and cutaneous and plexiform neurofibromas are key dermatologic findings. Plexiform neurofibromas are peripheral nerve sheath neoplasms derived from Schwann cells, axons, and fibroblasts intermixed with collagen ( Figure 1 ). The most common ocular problem in children with NF1 is optic pathway gliomas, present in 15% to 20% of patients. For more than a century, the connection of these seemingly random manifestations was a mystery. There is no correlation between the number of café-au-lait spots and other manifestations. There is a large variation in the manifestations found within the same family. Therefore, it is likely that other genetic and perhaps epigenetic factors influence the expressivity. The mechanisms that produce the wide range of clinical findings in NF1 are not precisely known. For example, it appears that neurofibromin helps control neural stem cell proliferation through distinct Ras pathways. Its dysfunction in NF1 may produce some of the known cognitive effects via this mechanism. Other possibilities for producing some of the wide ranging clinical findings in NF1 include other effects of the neurofibrin protein (its known Ras effect only encompasses 20% of the gene), affectation of linked genes, the effects of other modifying genes, mosaicism, and epigenetic factors. When indicated, genetic testing is accomplished with DNA analysis of the gene. A known positive result can be ascertained in 95% of people who meet the clinical criteria. Therefore, prenatal testing or testing of relatives is possible in the positive group. In 1920, the Dutch ophthalmologist van der Hoeve described the “phakomatosis” from the Greek word for “mother spot.” Under this rubric, he included tuberous sclerosis, von Hippel-Lindau disease, and NF1. Interestingly, all three have been shown to be issues with a tumor-suppressing gene. Martin , GA , Viskochil , D & Bollag , G et al. The GAP-related domain of the neurofibromatosis type 1 gene product interacts with ras p21 . Cell . 1990 ; 63 : 843 – 849 . De Luca , A , Bottillo , I & Dasdia , MC et al. Deletions of NF1 gene and exons detected by multiplex ligation-dependent probe amplification . J Med Genet . 2007 ; 44 : 800 – 808 . Editor's Note: It's amazing how one ingredient can influence so much of the dish. Bon Appétit! From the Department of Ophthalmology, NYU Langone Medical Center, Bellevue Hospital Center, and Manhattan Eye, Ear and Throat Hospital, New York, New York.